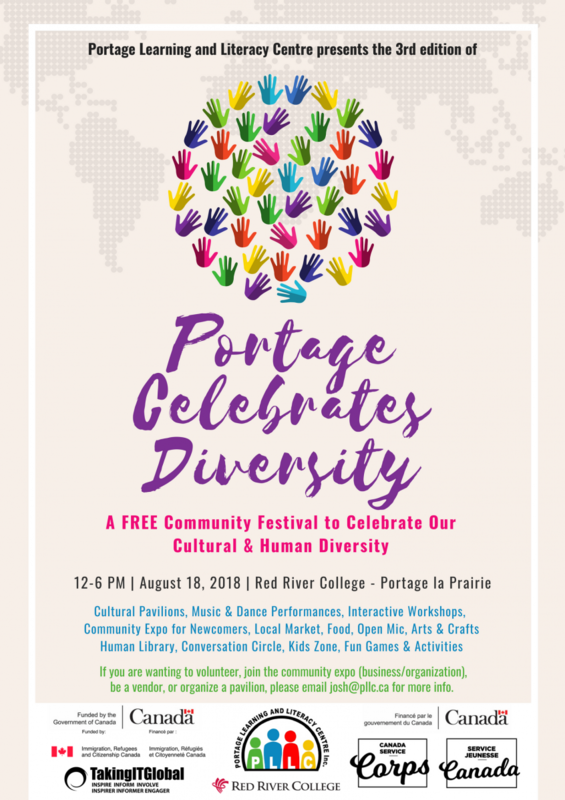 Thank you all who attended and participated in the “Portage Celebrates Diversity” festival at Red River College Portage Campus on Saturday, August 18th. This festival was a free, fun-filled community festival where attendees were able to experience new cultures and meet new people. Organized by Portage Learning and Literacy Centre (PLLC), the afternoon-long event offered multicultural mini-pavilions, music and art performances, food, artisans, interactive workshops and crafts, kids activities and games, and a community expo for newcomers. Despite being a little warm with temperatures around 30 degrees Celsius throughout the afternoon, everyone really enjoyed all of the festivities, music and food, and we look forward to building on our partnerships to make it bigger and better next year. Thank you to all of our volunteers and all those involved in making this year’s event a success!